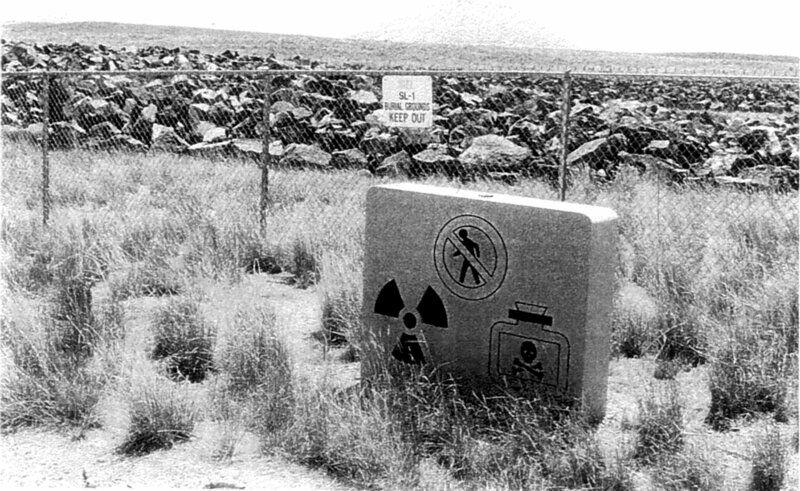 The SL-1 burial ground in 2003, as taken from an EPA report published that year. Underneath the surface are what remains of the SL-1 nuclear reactor, the building that contained it, tons of contaminated soil and rock, and some of the remains of the only people killed by a reactor accident in the United States. There have been three nuclear power plant meltdowns that have captured worldwide attention and left the general public with the opinion that nuclear power is too dangerous to rely upon. The most dangerous have been the meltdowns at Chernobyl in 1986 and Fukushima in 2011, both of which have left large areas where no-one can live. Three Mile Island is the other name to conjure with, though it was considerably less disastrous than the other two (it rates a 5 on the INES scale of accident severity, while the other two are a 7). To this we can add the Windscale Fire, also a 5, which was covered in secrecy at the time but became a rallying point for opposition to nuclear power in Britain after it became known in later decades. There have been several other meltdowns and partial meltdowns besides these, few even as severe as Three Mile Island, and in many cases they occurred in the early days of nuclear power when reactors were experimental and so correspondingly more dangerous. Most were clear of fatalities, but the SL-1 meltdown in 1961 killed three people. What’s particularly unusual about SL-1 is that it was at the very least a case of egregious operator error, and there exists the possibility that it was a bizarre case of murder suicide. In 1954 the US Army began a project to evaluate nuclear reactors for use in the Arctic, as they were ramping up to build the DEW line in the extreme north of Canada and Greenland. Their requirements were strict: small, simple, low maintenance, and able to be flown in by air. They were also to be stationary (as opposed to naval submarine reactors) as well as low-power (200 kW of electricity and 400 kW of heating), hence the initials SL. The idea was to be able to set one up and forget about it, giving very isolated military installations reliable power. By 1957 they contracted the Argonne National Laboratory, near Chicago, to build them an prototype reactor that met their needs; by the end of October 1958 it was built and operational on the National Reactor Testing Station, in the wide-open spaces of southeast Idaho about forty miles from Idaho Falls. Army personnel, mixed with some Navy, began training on SL-1. What one of these trainees would have encountered on leaving the reactor’s support building and climbing the stairs to the top of the small, cylindrical building containing the reactor was something a bit like a missile silo. There was a circular working area, the center of which was taken up by the top part of the reactor where the control rods could be manipulated. The reactor and its water cooling mechanism were beneath this, descending to the ground level. On December 21st, 1960 the reactor was shut down for maintenance, recalibration, and the installation of instruments for monitoring the neutron flux in the reactor core. Work to get the reactor back up and running began on January 3rd, 1961. On that day the reactor was configured for less power than it was designed for, 3 MW, with only 40 of 59 possible fuel assemblies in place and five (of nine) control rods. It did mean that the reactor would be more sensitive to manipulation of the control rods, though, and in particular the “one stuck rod” rule—that it should still be possible to shut down the reactor even with one rod stuck in the “completely out” position—was contravened. In the evening of January 3rd the personnel working on the reactor were two Army Specialists, Richard L. McKinley and John A. Byrnes, and a Navy Seabee, Richard C. Legg. At 9:01, Byrnes was performing a part of the restart that required him to manually pull up the central control rod by 10 centimeters to reattach it to its drive mechanism, which was disconnected as part of the shutdown before Christmas. Post-incident calculations showed that instead the rod was abruptly lifted by 66.7cm. At 58.4cm the reactor went prompt critical. In the split second it took for the rod to travel the remaining 8.3cm, the reactor spiked to 20 GW, 6300 times its safe operating capacity. Just prior to the spike the recommissioning protocol had dictated that the reactor be largely drained of water. Under the influence of the immense surge of power the remaining fluid caused a water hammer that that traveled through the air separating it from the top of the reactor vessel and hit it at 175 km/h. The resulting pressure smashed the entire top of the reactor into the ceiling of the reactor building at high speed. Nine minutes later the first responders appeared, on-site fire personnel reacting to a fire alarm. They’d been dealing with false alarms most of that day and expected more of the same. At first all they saw was some vapor rising from the building, which was normal given the extreme cold (the low the night previous had been -6°, measured in Fahrenheit, which works out to about -20 Celsius). Instead their radiation detectors spiked as they climbed the stairs of the reactor building. From there the reaction to the incident steadily escalated until at 10:45 PM sufficiently protected rescue personnel managed to enter the badly damaged control room to retrieve Byrnes, who was dead, and McKinley, who was still alive but was contaminated to the point that he was emitting 500 roentgens per hour. He succumbed to head trauma shortly after, but could not have possibly survived the dose of radiation he had received even if he hadn’t died of his wounds. Fifteen minutes later they found Legg, also dead—he had been impaled to the ceiling by one of the plugs used to seal the unused control rod channels. When he was finally retrieved six days later he showed little sign of decay; the radiation had sterilized him and the immediate area of any possible microbes that might have done the job. At first a regular explosion was suspected, and the assumption was that the high radiation levels detected were incidental after the reactor’s fuel was spread around the building, but analysis of Byrne’s gold watch showed that it was laced with highly radioactive 198Au, which was only possible if the reactor had gone critical and bombarded the watch with neutrons (that particular isotope being precisely one neutron heavier than regular, stable gold). The question then became “Why was the central control rod moved so far?”. Ultimately the investigators settled on the theory that it had stuck in its channel when Byrnes tried to lift it, and that he was moving it back and forth to unstick it. He succeeded while pulling too hard, the rod came loose, and the three were dead before he even had an idea of what he had done. Countering this is the fact that, while there were incidents of control rods sticking in SL-1’s past, they had all happened while the reactor was operating. The reconnecting maneuver Byrnes performed on the cool reactor had never once produced a report of a stuck rod. Apart from their favored hypothesis, the investigators felt that they could not rule out two other possibilities: suicide, or murder-suicide on the part of Byrnes. Operators of the reactor knew the consequences of pulling out the central rod of the reactor. In a history of the Idaho nuclear reactor test range published in 2012, former operators were quoted as saying that, informally, they’d decided to do just that in the event of a Russian invasion, destroying SL-1 to deny it to the enemy. There was probably tension on the reactor site when the three began their work shift at noon that day. Byrnes had been assigned to the program the same month as Legg, October 1959, but he’d been surpassed by his classmate and January 3rd was the first day where Legg was Byrnes’ supervisor. Things got much worse for Byrnes at 7:00 when he received a call from his wife, Arlene. Their marriage had been in trouble for some time and the Christmas break had made things worse. Over the phone she asked him for a divorce. At the very least Byrnes was probably not focusing as well as he could when 9:01 rolled around. An accident is certainly possible, but so too is suicide. In the absence of any living witnesses to testify to his state of mind in the last two hours of his life, it’s impossible to tell. Whether it was also murder depends on how much credence you want to lend to the idea that Byrnes wanted to take Legg with him. As it happens, their new job situation was not just a source of tension between them but the latest. Several sources cite them coming to blows at a party the previous year. One way or another, three men died in an instant. Legg is buried in Kingston, Michigan, outside, not too far from Flint, though his remains are in a lead-lined casket inside a metal vault with a concrete lid. Parts of all three men were so radioactive that, after they were autopsied they were not buried religiously but rather treated as dangerous waste and moved with other dangerous residue of the accident to a site 500 meters northeast of SL-1’s former site—it being deemed too dangerous to move all of it by public highway for 26 kilometers to the site normally used for radioactive waste. Along with those mortal remains of the men killed by the only fatal reactor accident in US history, the ultimate reason for the explosion lies sandwiched between native basalt bedrock and tons of rip rap in a dry and dusty part of rural Idaho, never to see the light of day again. Meltdown: The SL-1 Nuclear Accident, a contemporary training film presenting the accident the nuclear professionals, now on YouTube. Contains a great deal of footage of the cleanup effort. 2003 Annual Inspection Summary for the Stationary Low-Power Reactor Burial Ground, PDF of an EPA report on SL-1’s burial site, and source of the image at the top of this entry. Proving the Principle – A History of the Idaho National Engineering and Environmental Laboratory, 1949-1999. A free book (in PDF format) outlining the history of the whole time and place, including one chapter devoted to SL-1 both before and after the accident. Page 149 is the source of the information that the operators knew what would happen if the central control rod was removed. A few mistakes here. The most obvious is if his name is C. Legg or Clegg. Both are used. You’re quite right. It’s “Legg” and I’ve fixed that up. Thanks! Every single one of these incidents has some kind of soap-opera story associated with it, and it’s almost never true. It is awfully convenient for the chain of command to find someone to pin the blame on, and people like you love to repeat and pass on the story. Can you point me in the direction of some evidence, Moruch? I’ll happily change my mind about anything, but I need more than another story. Onus is on you to show that the phone call actually existed, given that every single major incident has one of these stories. You can’t find a single legitimate source for that phone call happening. As for some evidence, try the accident report which mentions nothing of the sort. Again – name a case of something going seriously wrong that didn’t have a fake love triangle story attached to it. Given how common this kind of BSing is(see Clayton Hartwig, or see any of a number of industrial accidents), the person claiming it actually happened is the one who has to show evidence, not the person doubting it. A combination of witness interviews and forensics. Reading between the lines, I’d say the AEC encouraged the murder-suicide theory as a distraction from criminal incompetence. When some blogger starts criticizing & trying to discredit the site owner, it is usually some gov’t hireling paid to discredit any info which they don’t want publicized. Most loudmouths & blogger bullies are gov’t hirelings (usually paid college students) deliberately trying to discredit the info and the provider. It is better to moderate the hireling bloggers who do this & keep their comments off the site rather than argue with them. They clearly want to frustrate the site owner into quitting. The first clue is the attacker can’t possibly have any personal knowledge of a phone call (whether it did or did not occur) to merit an attack upon you in the first place. So this is clearly a gov’t hireling trying to bully you into changing your article. 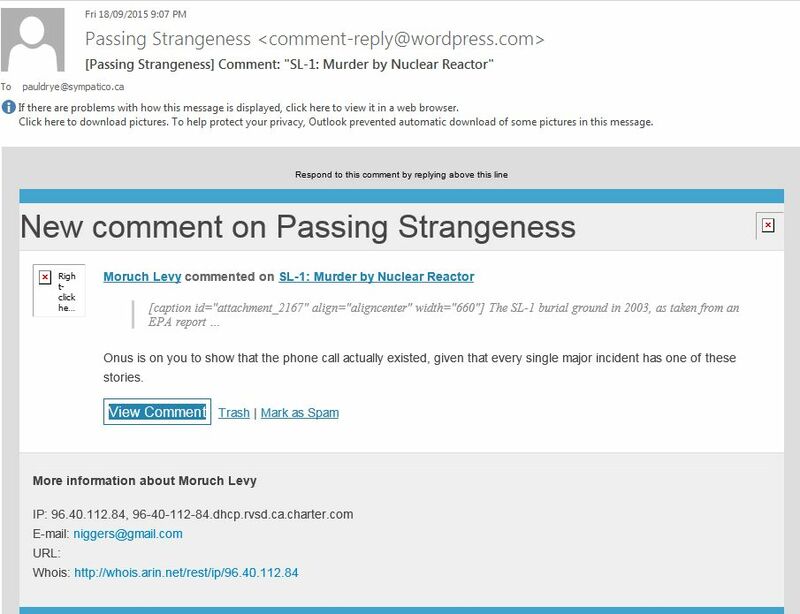 I find that moderating negative comments from appearing on your site does wonders for everyone. You are not required to post negative barbs. It is your site. My bloggers are very happy not having to contend with hireling attacks. If the hirelings get nasty because their comments are blocked, ban their IP addresses. You & your site will be much happier without the attacks & so will your visitors. That reactor was a poor design and I believe the only one ever to use a central control rod capable of causing criticality by itself. There were numerous log entries of it sticking and the problem was not addressed. The most likely scenario was that it was sticking when they were trying to reconnect the drive mechanism and it suddenly freed as they (unwisely) tugged on it causing an unintended, excessive withdraw and the reactor went prompt critical on a four millisecond period. That means the energy it was producing doubled every .004 seconds… with that their fate was sealed in the blink of an eye. There was about two foot of space between the water level in the reactor vessel and the reactor head. The steam explosion at the core was so violent it drove the water up with such force that when it hit the head it lifted the entire reactor out of its mounting shearing all the connecting piping. IMHO these men were made scapegoats, used by officials and business to cover their fault both in a poor design and failure to address the control rod sticking. The murder/suicide story is obscene. Your info about where Richard Legg is buried is wrong. He is buried in Kingston Michigan. As he is my Great-Uncle and my Great-Grandmother (his mother) insisted that he would be buried there not Arlington: https://www.findagrave.com/memorial/67718734 He is buried with the lead lined casket and concrete on all sides of it. Thanks for update, Brian. I’ve changed the article to reflect the correct information you passed on. Very interesting. I worked At CE and was involved with the post calculations. I agree…it was not some personal problem, but a bad design..it was an accident designed to happen”! I was in charge of CE’s Physics, Statics Group. Oh yes.. A “NAVY SEABEE”? Not air force? The navy would NEVER send a trainee to a place like that! Thanks! I’ll fix the date on this one.